Tintin will soon reach 90 years old, a fact hard to believe. Somehow, ever since January 10 in 1929, the day when together they took the train to the Soviet Union, the renowned reporter and his inseparable side-kick Snowy have surrendered nothing of their timeless appeal. As it is, the Soviets have passed into history but Tintin's adventures retain their same old magnetic power unabated. Reprinted and published in ever greater numbers, the books are a source of inspiration for artists, writers, producers, and directors. Tintin personifies all of the universal values that are a mirror to everyone's own aspirations. Eternally youthful, the indefatigable reporter continues to conquer the world with unflagging, never-failing vitality. Since 1929, more than 250 million copies have been sold. The Tintin adventures have been translated in more than 110 languages. 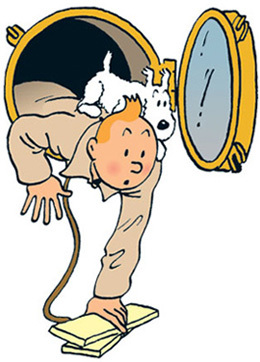 The real name of Tintin's creator is Georges Remi. By reversing his initials to R.G. he created his pen name : Hergé. Tintin explores the moon in 1953, i.e. 16 years before Neil Armstrong. The Thom(p)sons are not brothers nor identical. We can tell the difference between them by comparing their moustaches. The first appearance of Captain Haddock: The Crab with Golden Claws (the 9th adventure). Tintin is, of course, much more than the intrepid hero whose cause is just and whose heart is pure: he is the centre piece of a complex universe where we are placed face to face with our own reality. Characters such as captain Haddock, professor Calculus, la Castafiore, or Thompson & Thomson, are lending colour, depth, and perspective to his world. Tintin: a unique palette of qualities, combining breathtaking tales, clear line graphics, and themes of universal appeal. Researchers have never been loath to apply their talents trying to explain this exceptional work. Even though - and as happens with all true masterpieces - the magnetic pull of Tintin's fascination upon our minds may continue to baffle us, Jean-Marie Apostolidès advances a different ex-planation in his recent essay, Tintin et le mythe du surenfant (Éditions Moulinsart). And this novel understanding cannot but revive once again the pleasures of rerea-ding the famous Adventures. Has over 90 years, Tintin has indisputably earned his place amongst the great figures in world literature. In 1999, following a survey by Le Monde, readers of this newspaper ranked The Blue Lotus eighteenth amongst books that left their mark on the twentieth century. Tintin found himself in distinguished company indeed, side by side with Aldous Huxley, Solzhenitsyn, and Anne Frank.